In the modern era the term packaging turns from protecting products for distribution to a means of bradding. The primary purpose of packaging is protecting product and preparing for transporting, warehousing, sale and end use. In the modern era the quality packaging considers as a cultured way of presenting with respect. It really represents our affection and love towards the receiver . in shorts it becomes a part of our modern principles and civilized way of presenting. In the ancient period people used natural materials like leaves, wooden boxes and clay pots for packaging , which is an interesting subject for archeologists. It’s believed that Egyptians used papers to wrap vegetables the stepping stone to the modern concept of packaging. In the beginning of 18the century Europeans started to use tinplate for packaging. In 1667 Andrew Yarranton, an English engineer, and Ambrose Crowley brought the method to England and was improved by Philip Foley and Pontypool. Tinplate boxes first began to be sold from ports in the Bristol Channel in 1725.. Tobacconists inLondon began packaging stuff in metal-plated canisters from the 1760s onwards. The first corrugated box was produced commercially in 1817 in England. Scottish-born Robert Gair invented the pre-cut paperboard box in 1890. In the modern age the concept of packaging shifted from enfold to representative. A well-presented thing to be encased beautifully and easy to carry. The enclosed item to be secured and well placed is the primary purpose of packaging. Packaging can play an important role in reducing the security risks of shipment. “Silent Salesman”, the concept of packaging changed as a mean to build brand image and increase purchase value. It is used to improve brand value and differentiate a product from the masses on the retail shelf, increase sales volume s and provide the consumer with a positive experience. The packaging is the silent salesperson sitting next to the competition. As we know, packaging must not only get busy consumers attention but builds a brand image in the customers mind. As the product designs are changing fast the packaging designers must not remain stuck in the past, but look to the future. Products and packaging that project a forwardlooking image to penetrate the customer’s heart. In the case of jewellery packaging the brand concept can inculcate the customers mind by keeping the same brand display colour code and patterns. It can resemble the displays in many ways that can impress the people. The shelf life of the packaging is actively communicating with its surroundings that give a good impact on the brand. Since the importance of goodpackaging is so high all the leading brands in the world is paying much importance on this. The uniqueness of the packaging itself can announce your brand that will last long and wide. Above all it’s the responsibility of the entire community to make this planet a better place to live by protecting environment. To be a part of it better to minimize the usage of plastic, synthetic leather etc. and promote paper boxes and bags. Promoting paper packaging material is a promise to the next generation. 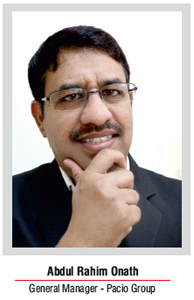 Has good knowledge on VM and Packaging industry . Acquaintance on production technology gives precise on perfection. Vision: lead the company as the last word on VM solution and packaging in the world.